Arie Graafland is the director of a doctoral program at TU Delft and a principle who owns his own firm in Amsterdam.This essay was published in 2006 when there was a large debate on the state of architectural theory and notions of projective practice in the Netherlands. In the essay, graafland mainly questions Michael Speaks’ argument for an intelligence-based organizational model for architecture and he calls for a reflexive architecture, which evolves from interactions between university and design offices. 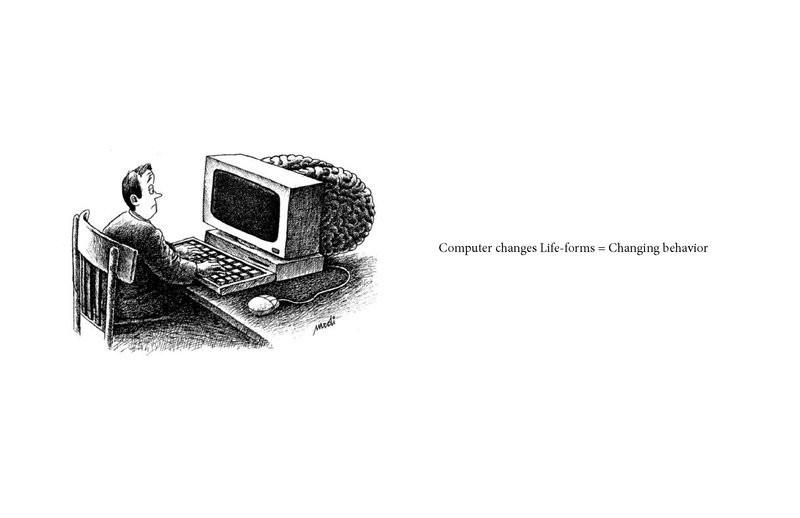 The essay starts with Arie’s personal experience of interacting with the computer, points out that computer has changed people’s life-forms and are changing our behaviors in a lot of ways. And Arie refers to William Gibson about the concept of Cyberspace in 1980s, which the cyberspace is about networks, compatibility, power, data and information new forms of architectural practices, office organizational strategies and profiling. And then Graafland talks about Speaks argument that Network practices in the 1990s became communities that are more powerful than any single studio of office. In order to better understand the truly innovative practice, which speaks believes, he refers to transition from Fordism to flexible accumulation, which is described by David Harvey. 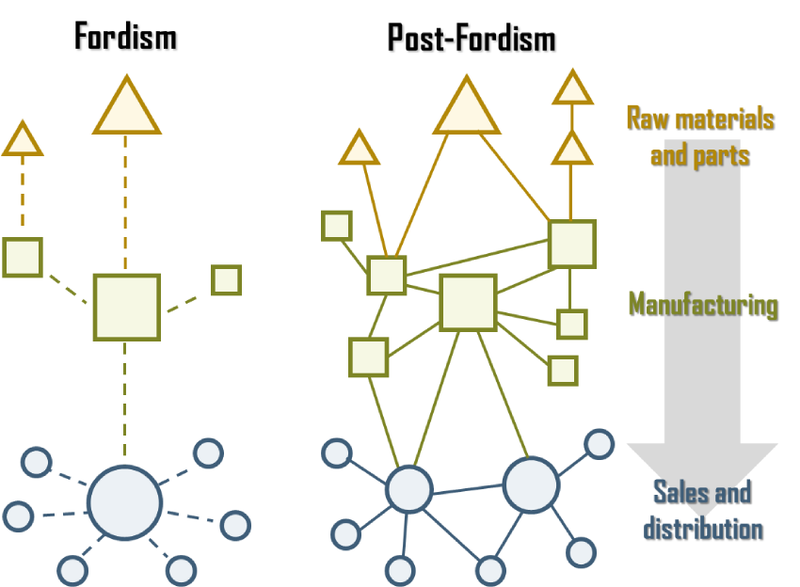 David explained the transition process by pointing out the inability of Fordism from 1965 to 1973 caused by rigidity,. And later during 1970s to 1980s it was a trouble period of Economic restructuring, social and political readjustment. The Shift rests on – Flexibility – characterized by the new sectors of production, new ways of providing financial services, new markets, greatly intensified rates of commercial, technological and organizational innovation. However According to Speaks, these innovations on intelligence-based organizational model are ignored even by the most forward-looking architects like Greg Lynn (LA) who took advantage of electronic imaging and new communication technologies. The conclusions are that the innovation can be achieved when the principals are far more involved in academic research-related work other than the majority of their colleagues. And he gives example of OMA & AMO and some architecture school’s new forms of research like GSD, Berlage Institute and TU Delft. Those groups are conducting the exploration of the fields of architecture and critical thinking. Speaks declared that the times of Critical Theory are past. He sees the New flexible accumulation of architectural image and practice, forms of management. New challenge to survive the fiercely competitive global marketplace.Only focus on American pragmatism & newly emerging forms of practice. There is a huge ignorance of the important shift in thinking and doing. Question is how can critical thinking be involved in this procedure? 2. Announce the “exhaustion” of critical thinking in the Universities. 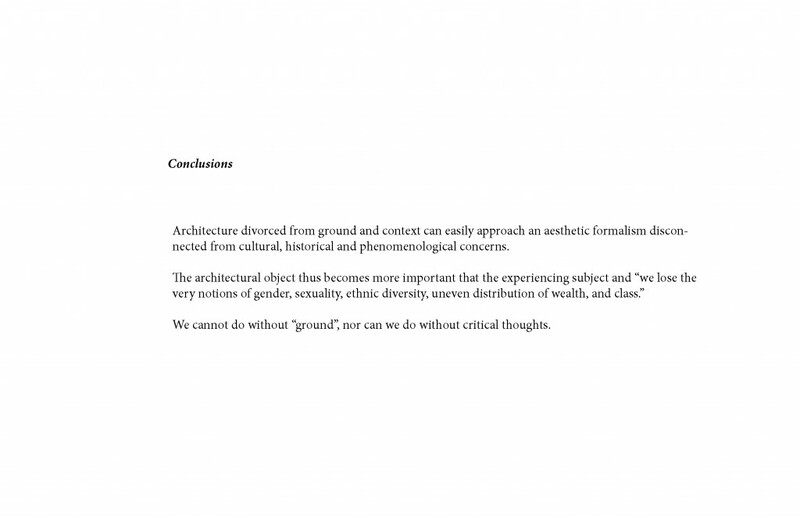 Graafland thinks those 2 points are not relevant however could be useful for archtiectural education. And he calls for the “Reflexive architecture” – an architecture addressing its own foundations reflexively, paired with the digitalized work processes on a larger scale than the traditional office practice. 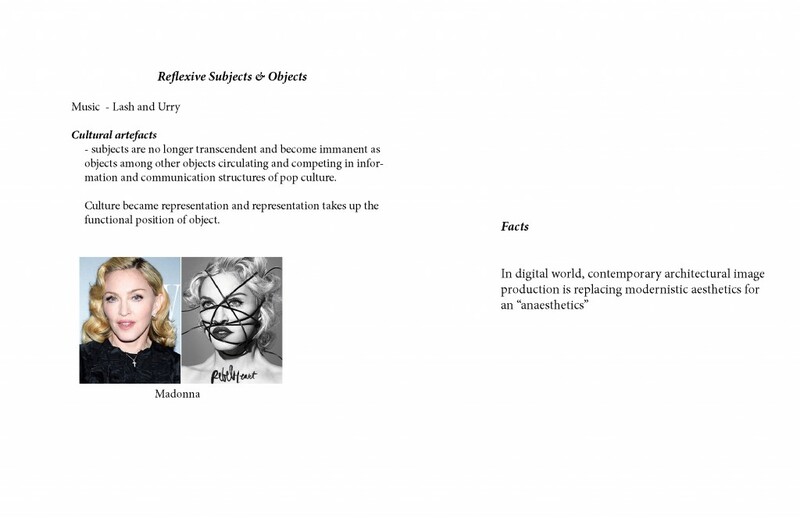 Reflexivity is an activity mainly in Universities where it relates to “critique” and contemporary notions of time and space. No offices can do this reflexive architecture on their own. “Contemporary obsession” with fashionable architectural projects that are oblivious to their cultural context, to their intended programs, to their historical roots, to ethical imperatives and to our experiencing body. Problem is on the level of a software-driven flattened out aesthetic reflexivity. which is seen in production and consumption of the culture industries. Philosophical, political and scientific truths have fragmented into proliferating swarms of little “truths,” appearing and disappearing so fast that ascertaining whether the are really true is impractical if not altogether impossible. In graafland’s words, we need to be precise to say critical. And criticality can be related to “retrospective”, historical and critical analyses. Criticality Under a lot of pressure or is fading away completely in social theory and philosophy. The critical architectures of 1960 and 1970 had none of theoretical, political or philosophical gravitas of their early twentieth century predecessors. Architecture as a projective and creative aesthetic practice can never be both solidly and safely guided by critical theory which is retrospective by definition. However, there are many stable ways to analyze and organize the context, the program, the construction, the budget. While Philosophy in this context leads to a confusion. It is needed to question the status and usefulness of deconstructionism, critical theory, and ideas about society and nature. The lineage of criticality in architecture starts with Peter Eisenman and accompanied by Michael Hays, who has developed a position consistently focused intellectually on concept of resistance and negation, both refer to Tafuri. For Hays, Mies van de Rohe is a paramount exemplar of negation in late Modernism Critical, resistant and oppositional. In 1922 skyscraper project you can see the Surface Distortions and formal inscrutability. You can see the critical assessment from sociology or philosophy and the argument that Relation between project and city needs a critical reading of both city and architecture Open up a clearing of silence in the chaos of the nervous metropolis; it is silence that carries the burden of meaning in this project. Relation between project and city needs a critical reading of both city and architecture. projects that have to meet the more difficult test of being critical “in the street”; relate to notions of “lived space”; projective thinking as in reflexive architecture. For graafland, The human body and its ground are the key elements in reflexive architecture. On the other hand, Peter Eisenman gives argument that architecture was place-bound and linked to a condition of experience. Architecture cannot be bound by static conditions of space and place, but new conditions like the “event”.